This quilt started out playing around with Kaffe Fassett’s gorgeous fabrics. I decided to cut random paper shapes from folding circles of paper and then layering them on top of each other with the background fabrics showing through. Several hours were spent satin stitching the raw edges. I used fluro threads on some which give a wonderful light and fancy embroidery stitches on others. After a small pile of these ‘saucers’ were sewn I played around with them on my design wall. Slowly the idea of dinner plates evolved and using an old white damask tablecloth of my Mother’s I added colourful ric-rac to help fold the edges under smoothly and then sewed them onto the table cloth. I had envisaged lots of delicious quilting so using a washable blue felt pen I free hand drew paisley type shapes all over the background and using various coloured threads quilted the entire background. The multi-coloured ric-rac under the binding added the finishing touch. 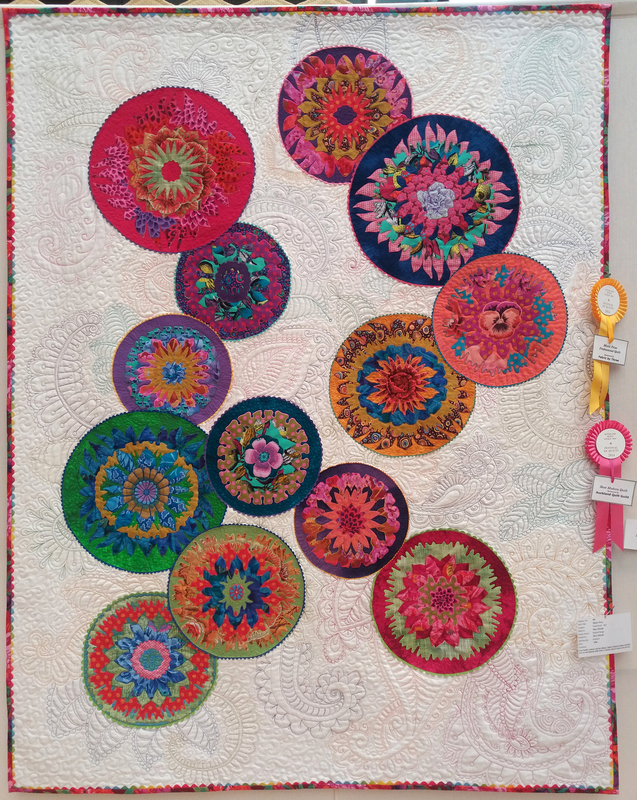 At Auckland Quilt Guild’s 2016 Festival of Quilts this quilt won Best Modern Quilt and Merit in the Professional Large Quilt category. Congratulations, you quilt looks wonderful. Kaffe Fassett fabrics are so colourful and vibrant. Love your design.